For all of you who have South Africa on your wish list, NOW is the time to go. The dollar's stronger than it's been in a while ($1 equals @10 South African RAND), the weather's warm and sunny through March, and there's an incredible range of things to do far and beyond the must-experience safari (from winetasting to visiting local townships to hanging out with the South Afican penguins!). 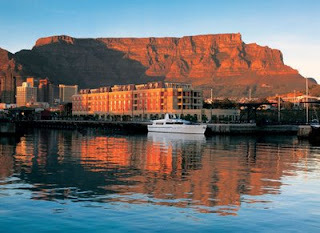 Start with a few days in Capetown, at the Cape Grace Hotel. Not only is the 121-boutique hotel perfectly located on the V&A Waterfront, but service is unbelievable, rooms were just totally redone, the water views are excellent, the Whisky Bar hopping, and dining at Signal, the hotel's restaurant, is a must (the sole meuniere and the rib eye are among the priciest entrees at just $22-ish, half what either would cost at a top restaurant at home! Honeymooners will love the romantic gifts the hotel provides for them nightly, and kids are also catered to (we love the pint-sized bathrobes and slippers laid out for them at night, and the African story-time held in their honor). Book a stay here through Elite Travel International and we'll ensure VIP treatment by our friend Nigel Pace, the hotel GM. Not to mention, you'll enjoy lots of extra perks as our exclusive rates include daily breakfast, complimentary use of the hot spa facilities, 24-hour free internet access in the biz center, in-room work-out equipment, chauffered rides within 6 mile radius and your choice of a traditional afternoon tea for two or a glass of local Cape wine with snacks. NB: Several luxury cruise ships sail here as well so inquire within if exotic luxury cruising's your style! Did you visit The Bay Hotel while in Cape Town? We loved this boutique hotel that had Table Mountain as background and the Atlantic Ocean as foreground. AWESOME. I'll keep you in mind when we plan a trip back.